Electro Optical Components Inc.: FEMTO offers the ultra low noise variable gain current (transimpedance) amplifier DDPCA-300 for very sensitive current and charge measurements. The DDPCA-300 has a switchable gain from 104 to 1013 V/A. It has an extremely low noise input of 0.4 fA/√Hz minimum allowing measurement of currents in the femto to pico Ampere range. It also has a dynamic range of 240 dB. Features include adjustable voltage directly on amplifier input for DUT biasing, DC optimized design with high stability and very low drift and manual control and remote interface. It comes in a miniaturized and rugged aluminum housing which is designed to optimize EMI shielding. The small size lets you get the amplifier close to the detector, minimizing noise from long detector leads. 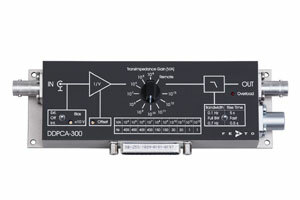 The DDPCA-300 is the ideal tool for amplification of small currents close to DC generated by high impedance sources, such as photodiodes, PMTs, ionization and particle detectors. Typical applications include spectroscopy, photodiode amplification, sensitive ionization and charge detector amplification, conductive atomic force microscopy (cAFM), characterization of MOS and JFET structures, quantum and biotech experiments, and pre-amplification for oscilloscopes, A/D converters and digital voltmeters. The FEMTO line of high quality specialty amplifiers for signal recovery and processing are sold by Electro Optical Components. These products include Low Noise Current Amplifiers, High and Low Frequency Voltage Amplifiers, Photoreceivers, High Speed GHz Amplifiers and Lock-In Amplifiers.